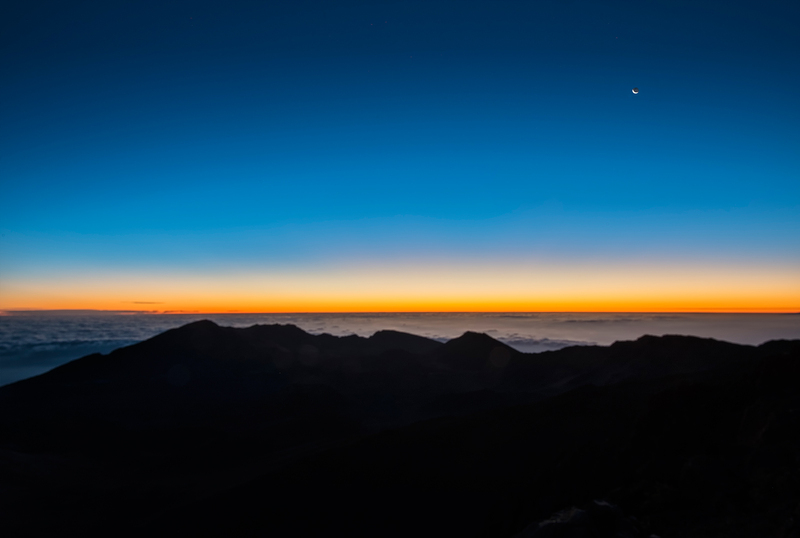 During a three-week stay on the island of Maui, in February, 2015, I finally accomplished something I had thought about doing for some time: witnessing a sunrise on a clear morning at the top of Mt. 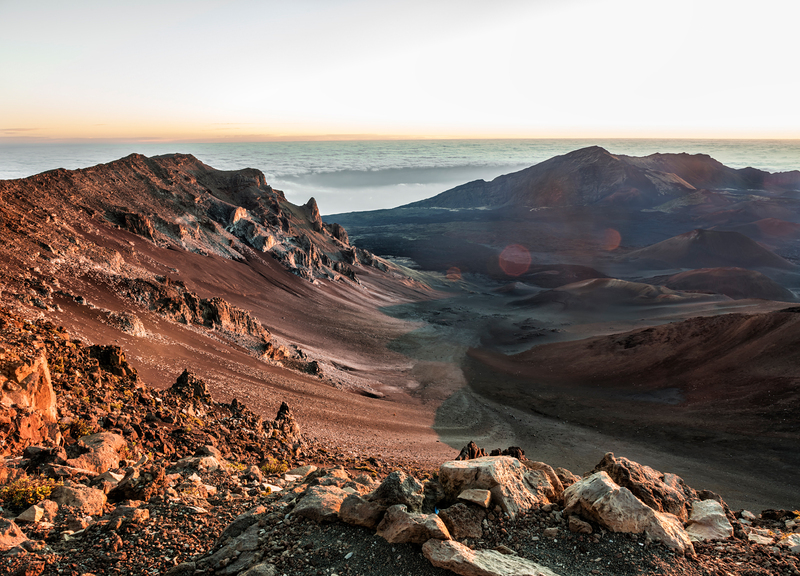 Haleakala, the huge dormant volcano that forms most of the eastern portion of Maui. While I had been to the top of the mountain on a number of previous occasions, including during previous visits to the island, getting there at just the right time and in just the right weather conditions is not as easy as it might first appear. The Haleakala Highway, the single, 36-mile-long road to the summit, traverses more than 50 single-lane bridges and winds through dozens of hairpin turns, often at the edge of steep drops. The drive from the bottom to the top generally takes at least an hour, in addition to the time it takes to get to the entry point of the highway from wherever you may be staying on the island. 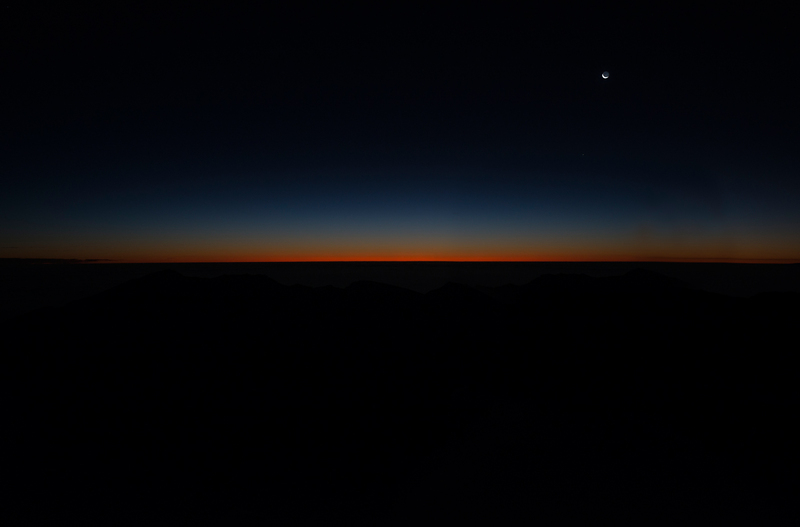 There is of course no guarantee that, even if the weather on the island is clear when you start your journey in the dark early morning hours, it will still be clear when you arrive at the summit. 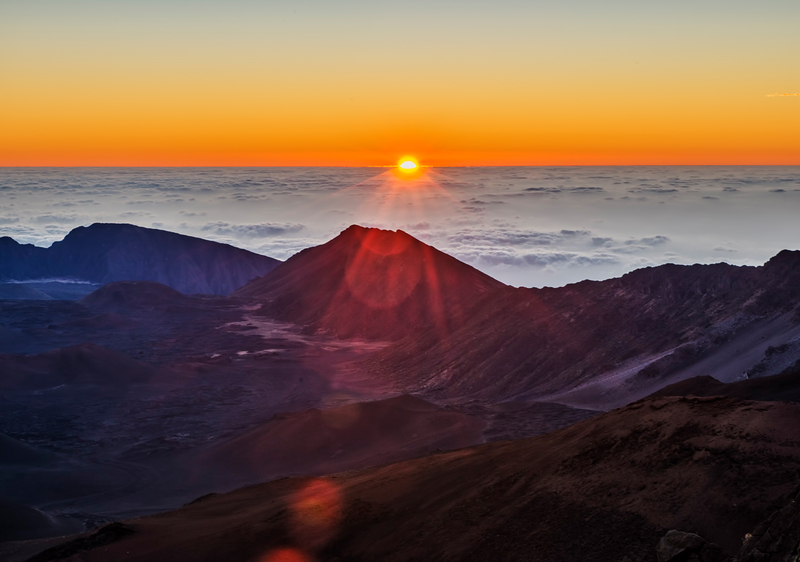 During February, sunrise on Maui occurs at about 7:00 am, and to be assured of a parking space at the Visitors’ Center at the top you need to arrive no later than 5:45 am. (2017 UPDATE: You now need an advance reservation to get into the park for sunrise. Reservations can be obtained here: https://www.nps.gov/hale/planyourvisit/haleakala-sunrise-reservations.htm.) From the apartment where I was staying in Kihei on this trip, the drive to the top would take about 1-1/2 hours. My journey to the top therefore began at about 4:15 am and I arrived at the summit at almost exactly 5:45 am, just in time to grab the last available parking space. The weather on Maui that morning was mostly clear and there was a wonderful star-lit sky with a crescent almost-new moon. While there were some clouds around the edge of the mountain, their tops were at an elevation of about 5,000 feet, almost a mile below the summit of the volcano. Mt. Haleakala is more than 30 miles wide at the base and occupies virtually the entire eastern (larger) portion of the island, occupying about 75% of the land area of Maui. The upper portion of the volcano is contained within Haleakala National Park. Once you pass the entry point of the park, you still have about 10 miles to go to reach the summit. The park Visitors’ Center at the top of the mountain is at an elevation of about 10,000 feet. On the morning of my visit there, the air temperature was about 43° F, with a fairly strong wind. In expectation of the low temperature, I was wearing several layers of clothing. At this altitude, the air is thin and it is a good idea to limit your exertions to those that are absolutely necessary. Just before the rim of the sun broke above the horizon, bright orange sparkles appeared. Finally the sun made its appearance above the horizon. As it rose, it began to illuminate the dark interior of the volcano’s crater. Beyond the far rim, a layer of clouds, situated a few thousand feet below the level of the crater, stretched to the horizon. As the sun appeared, a park staff member chanted a traditional Hawaiian greeting. 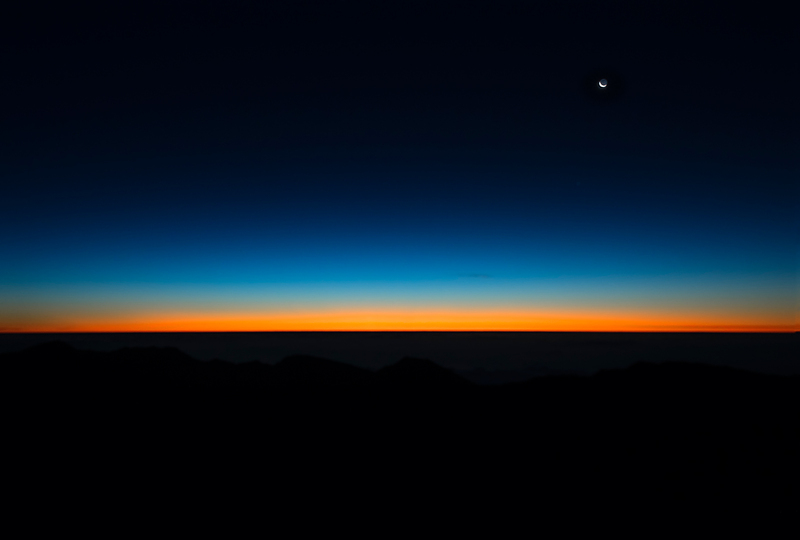 Experiencing a Haleakala sunrise is very different from watching a beautiful sunrise at sea level. Up here, you feel that you are part of the greater cosmos. This is a magical experience not to be missed by any visitor to Maui. For other photographs of Hawaii, please visit the Hawaii Gallery of my website. Please also visit my photography Facebook page. Exquisite shots Phil, can’t wait to see the prints when you return.